Hi there! I’m Julia from The Roasted Root, and this is my very first post on Oh My Veggies! I am thrilled to be joining Kiersten, Kare, Meg, and McKel to bring you fun and nutritious vegetarian recipes. I particularly love incorporating root vegetables into my cooking because of their versatility and abundance of health benefits. As a lover of the great outdoors, I enjoy “bio-hacking” my way through food and fitness, experimenting with new-to-me ingredients and cooking methods in order to optimize my health. I have also been known to balance a hefty plate of salad with a heaping bowl of ice cream. That happens, too. If you like to party like I do, you’ll need to detox occasionally. Food and booze happen in all the right ways, whether a dinner party with friends, a business gathering, or a backyard cookout. We’re wondering how many gym sessions it will take to be able to button our jeans again. Lucky for us, detox smoothies are a delicious way of returning our systems to normalcy. Hangovers are precisely why the detox smoothie was invented. To clean out the cobwebs, inject your system with immune-boosting nutrients, and right all the holiday wrongs that transpired. Smoothies are a great habit to be in, regardless of whether or not we’ve spent the last month putting decadent, sinful food in our bodies. Although I do a lot of experimenting with my smoothies – adding various fruits, veggies, cacao powder, nut butters, oats, spices, etc. – I can’t seem to drag myself away from a simple kale smoothie with ginger and blueberries. Hence, I’m showing you my go-to kale smoothie, which is equal parts delicious and nutritious. All ingredients combined make for a tasty and vitamin-packed kale smoothie that goes down reaaaal nice. There’s a perfect creamy balance of sweet warm flavors, leaving you feeling satisfied, refreshed, and un-clogged. Then you can party again without guilt! 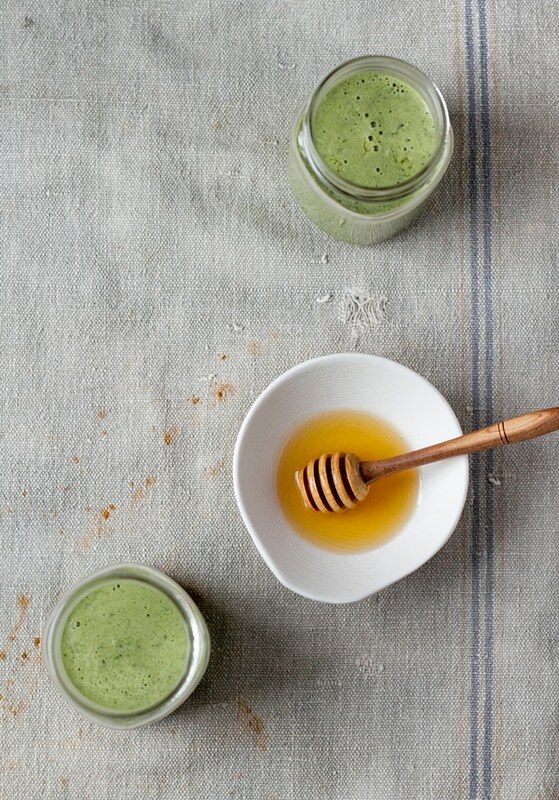 A healthy green smoothie to help you get over your holiday over-indulgence! Add all ingredients to a blender and blend until completely smooth. If necessary, add more almond milk to help your blender process the frozen fruit. Nice to meet you and talk atcha soon! I’ve made this twice now and it’s amazing! I added a scoop of vanilla protein powder for a boost. One of the times I did not have bananas on hand so I used frozen pineapple instead and it was still amazing! is there a way to figure out how many calories are in it? I used a packet of Stevia instead of honey, It tastes good but the color looks like army fatigues…. 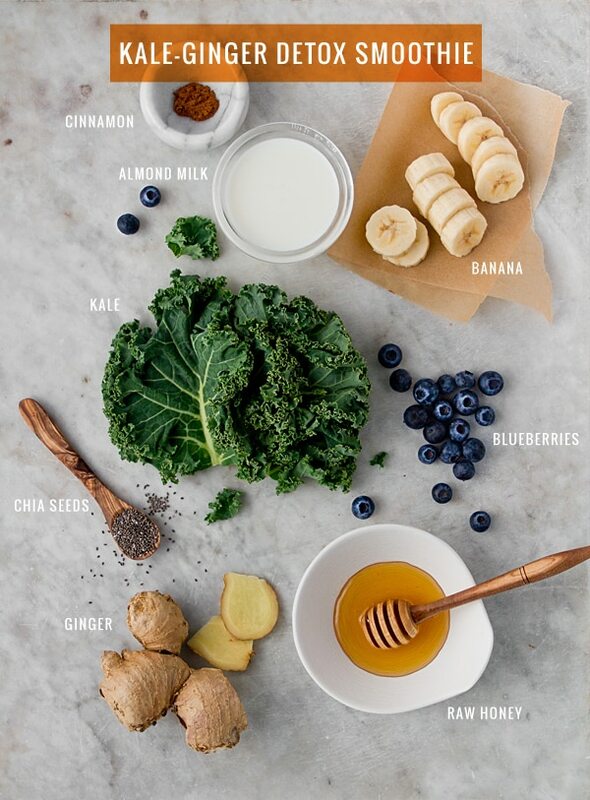 Thanks for sharing this kale-Ginger Detox Smoothie. It’s healthy and tastes amazing. I love ginger, so having it in there just does it for me. 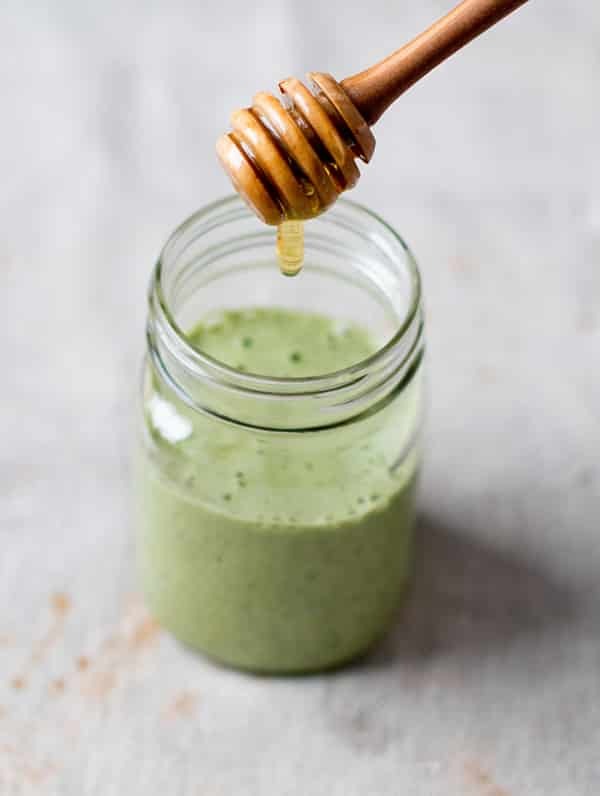 I love this recipe so much I used it as a base to create a detox one for my readers in this post here http://www.fitwirr.com/health/tips/kale-smoothie-recipes. Anyway, thank you for creating and sharing it. Can you substitute the almond milk And kale? Of course. You could sub the almond milk with whatever your milk of preference is, and switch the kale to another leafy green. It won’t be the same smoothie, but it’ll still be delicious! Hey Flora, smoothies are definitely best when freshly made, but usually they’ll last a day or two in the fridge. My younger brother who is SUPER picky enjoyed this smoothie! WOW! The ginger was a bit to much for my mom, but everyone has their personal preference. 🙂 Will be making again, thank you!